Fancy a padlock that is siren alarmed to protect your valuables? The two tone alarm is set to sound for ten seconds every time it is disturbed, and resets itself automatically. 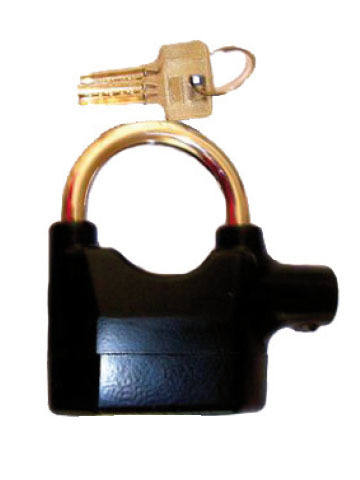 This extra strong cast steel lock now provides the extra security and peace of mind you are looking for. Countless locked sheds, garden outbuildings, garages and store rooms are broken into weekly with hardly a sound, but not any more. Disturb this little guy, and he'll make himself heard. Why tackle a lock that sounds an alarm when there are millions that don't? Use it on bicycles, motorbikes, garden tools, furniture and ornaments, tool boxes, vans, side gates, the list is endless. Why buy an ordinary padlock when you can buy one with a built in alarm at the same price? Can be used as a conventional non-alarm lock as well.